This week’s NexThought comes by way of Eric Kacou, the author of Entrepreneurial Solutions for Prosperity in BoP Markets, the latest piece of literature in the space of entrepreneurial approaches to development. I had the pleasure of meeting Eric recently, and had chance to ask him a few questions about his book and the ideas he puts forth on it. I encourage you to read below for an interview with Eric, and also learn more about his book and work. Francisco Noguera, NextBillion.net: Eric, tell us a little bit about your interest in “development through enterprise”. Where does it stem from? Eric Kacou: While I have studied and been exposed to various development theories, my passion for development through enterprise comes from my work with entrepreneurs on the ground in Africa. The seminal event is a seminar in High School where we visited successful leaders across sectors in Cote d’Ivoire. The entrepreneurs clearly stood out in my opinion: it was the entrepreneurs at these sessions struck me as the most interesting, innovative and passionate of the group. They also seemed to be the ones who were able to maintain the greatest control over their destiny. Since then I have met and/or worked with myriad entrepreneurs across Africa and other low-income regions. The impact that these entrepreneurs are having on their communities remains a constant inspiration and continues to fuel my work in development through enterprise. NextBillion.net: Your book, introduces two new concepts to the Base of the Pyramid debate: Mindsets and the Survival Trap. Let’s start with the first one: what are mindsets and why are they important in the context of Base of the Pyramid business development? Eric Kacou: Mindsets are the values, beliefs and associations that inform the actions that we take in all areas of our lives. Mindsets matter a great deal in the context of Base of the Pyramid business development because they drive the types of strategies individuals, companies, clusters and nations. As such, mindsets are the ultimate lever to create prosperity. Unfortunately, prevailing mindsets at the Base of the Pyramid are what I call the five evils: lack of trust, defensiveness, short-term focus, zero-sum thinking and avoidance of risk. These five mindsets often undermine the average citizen and most leaders. These mindsets are so pervasive that they impact the very way we view prosperity, development and the base of the pyramid itself. When we realize the role of mindsets and diagnose the Survival Trap, entrepreneurs and other leaders can identify and leverage specific opportunities in the high-growth, lucrative and diversified BOP markets. Rather than focusing on challenging operating conditions, it is possible to seize unique opportunities while transforming BOP markets. What is the survival trap? Can you provide an example of a company or a society that has successfully made it through the trap? Eric Kacou: The survival trap is a tendency for businesses and nations to focus on short-term crises at the expense of developing long-term strategies for prosperity. This vicious cycle keeps individuals poor, businesses struggling, and nations under-developed. The good news is it is possible to escape the Survival Trap, make money and create prosperity for all stakeholders. 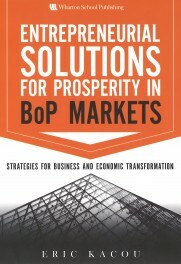 My book Entrepreneurial Solutions for Prosperity in BoP Markets profiles at least a dozen entrepreneurs that are succeeding at working their way out of the survival trap. Leaders like Dr. Manu Chandaria, Allon Raiz, Eva Muraya provide not only inspiring examples but also allowed me to outline the specific tools they used to succeed. What is important to note is that nations can also escape the Survival Trap. Rwanda, which is also profiled in the book, provides a compelling example of a nation that is working its way out of the trap. What is particularly exciting about the example set by Rwanda, is that it demonstrates the scalability of the solutions outlined in the book. Rwanda is a powerful example of the impact of collective mindset change. NextBillion.net: Do you see any risk of hype or “over heating” in the social enterprise/ BoP sector? If so, what do you think must happen for the field to move farther forward? Eric Kacou: Hype and ’over heating’ are definitely important risks for the industry. Beyond those, the single biggest risk facing the BoP/Social Enterprise space is repeating the same vicious cycle of exploitation and dependency. Entrepreneurs and leaders serious about economic transformation at the BoP must focus on business models and solutions that empower the average citizen. What the average citizen at the BoP needs the most is dignity. What she needs is also to be empowered to take control of their own destiny. Too much hype around social enterprise will eventually make it another avenue for aid as opposed to a real sustainable solution where incentives are aligned, scale is possible and lives are transformed. Any lasting impact depends on these factors. For the field to move father forward, what must happen is the same as what is required to escape the Survival Trap: it is a change of mindset. In our attempt to bring prosperity to the base of the pyramid, we must think beyond consensus and do business with moral purpose. Our focus must be to create products and services in a way which gives people the tools they need to prosper. NextBillion.net: What are your next steps, Eric? Where will you be spreading these ideas from? Where can our readers follow your work, especially now that you’re so close to finishing your Fellowship at the Kennedy School of Government? I have started a firm, Entrepreneurial Solutions Partners (ESPartners), with two other partners, Rob Henning and Charity Kabango. Founded on principles from the book, the firm empowers entrepreneurs and other leaders through intelligent capital (a combination of insights and capital) and prosperity ecosystems. Our objective is to serve a handful African nations as well as Haiti. Spreading these ideas is a marathon. For anyone looking for more information there are number of ways to stay connected with what we are doing. The first, would be to pick up a copy of the book! Second is to follow me on twitter @eric_kacou, you can also stay up to date on speaking events and other news by visiting www.eric-kacou.com . Last but not least, keep an eye on NextBillion.net for some contributions from me in the coming weeks and months. These contributions will focus on providing actionable insights anchored by on the ground experience deploying what I’ve called Entrepreneurial Solutions for Prosperity. Whichever the medium, I look forward to exchange thoughts and ideas with as many readers as possible. Thanks Eric for your generosity and for sharing your ideas with the NextBillion community! We look forward to hearing more from you in the coming months!